Handles practically any sized steel, plastic or fiber container safely and efficiently. Versatile unit features extra platform supports to hold 30- or 55-gal. drums as well as two 5-gal. pails and other smaller containers. Includes a removable handle with built-in bung nut wrench, seal remover, and manual drum tilter. 26"W x 16"D straddle. 1/2"H cradle has a beveled front edge and rolls on (2) 6" x 2" rigid wheels and (1) 3" x 1" swivel caster. 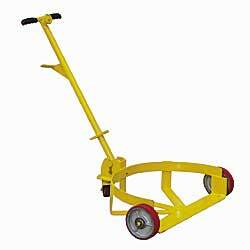 All-welded steel construction with powder coat safety yellow finish. IN STOCK. For use with steel, plastic, or fiber drums.